It was a rainy day, which never helps. Those days usually are slow. I was tired of doing electrical work, so I focused on something that had been on my radar for a while (never mind that my radar actually looks like Times Square on a Saturday at 10:21pm, bright and crowded). The ADA bathroom shares a wall with the beer hall. This in itself shouldn't be a major problem, but in that wall we also installed the hand dryer, and they can be a little bit noisy. So I stuffed some sound insulation into the wall cavities, and used some spray foam around the hand dryer. 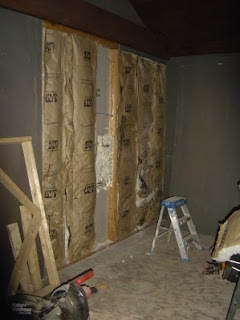 I actually had to remove a piece of drywall, which we had already installed. While I had the wall open, I fixed the electrical box for a wall sconce in the bathroom (I know, I said I was a little tired of electrical work, but a man's gotta do what a man's gotta do).